Guter Track mit schwachen Lyrics. 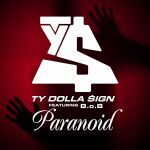 The production is promising, but the rest just isn't and I can't take it seriously enough, I mean, his name is Ty Dolla $ign (we already have Ke$ha and A$AP Rocky, do we really need another one of those?). And what a crappy performance on The Tonight Show, he obviously can't sing either than rap. I'm not awfully motivated toy listen to any more of this wannabe's music.